Did I mention Vienna was cold? Freezing!!! The temperature kept being under zero degrees, with minimums around -8 and maximums at -1 tops. I did not mind as I was well dressed (plus gloves, scarf and hat always) and the absence of humidity made it that much easier to bear. Seeing my first snow in Vienna was a nice surprise, when I visited the Messe Wien exhibition centre, just near Prater. Spend the day there working (and had a mean chilli con carne at lunch), returning to my hotel in the afternoon. I was ready to enjoy a nice Viennese coffee! But not before a nice walk through the city centre. I took Graben again, admiring the decorative chandeliers giving the wide street the aura of a ballroom, stopping to see the Pestsäule, a monumental column built in 1693 to mark the end of the big plague of the mid-1600s. Then Peterskirche came into view, just at the crossing with Jungferngasse. This is one of the finest Baroque churches in Vienna, standing on the site of a church originally founded by Charlemagne. Built by famous baroque architect Johann Lukas Von Hildebrandt, it has an impressive fresco painted by Johann Michael Rottmayr. Chanel: the 12,000 euros top! I turned to Kohlmarkt Strasse, named after the coal market that used to be there, that connects Graben with Michaelerplatz. The pedestrianized street is lined with expensive designer boutiques and various luxury shops. 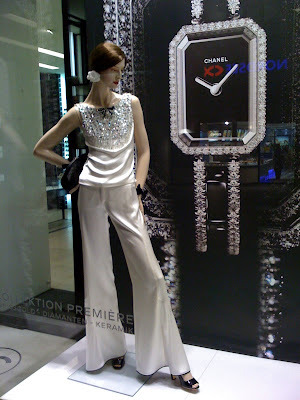 At Chanel, I saw an outfit that had a hefty price tag on it: 12,000 euros for the beaded top alone! On the opposite site, at number 14, stands Demel, one of the finest coffee houses in Vienna, and the biggest rival of Sacher: they still argue over who made Sachertorte first! Passing through Michaelerplatz, I saw again Michaelerkirche, imposing with its high tower over the square. It is the oldest building there, dating back to the 13th century. So I went to Café Central: one of the most famous and elegant Viennese cafés, opened at 1876, where people like Peter Altenberg, Egon Friedell, Hugo von Hofmannsthal, Anton Kuh, Vladimir Lenin, Adolf Loos, Leo Perutz Alfred Polgar and Leon Trotsky met! Also the famous Vienna Circle of logical positivists held many meetings here before and after World War I. Uponentering, one can see Peter Altenber himself (or rather his plaster effigy) still enjoying the place! 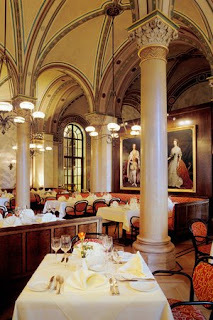 The cafe is located at Herrengasse 14 at the Palais Ferstel (named in honour of the architect Heinrich von Ferstel. The style is neo-gothic (arched ceiling and columns) with Art Nouveau (or Jugendstil) and Venetian Renaissance on the outside of the building. 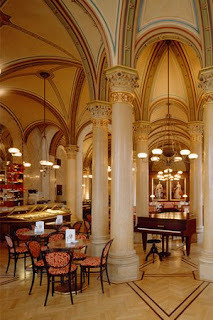 It is a typical Viennese café in everything: great surroundings, nice melange coffee (although only one size served - small) and an astounding offering of desserts and free newspapers to read. I skipped the latter (all in German) and instead focused on the delicacies displayed under a glass canpoy: my eye fell on a spectacular mix of berries, chocolate mousse, orange mousse, topped with orange slices and a small leaf of gold...brilliant! The mix of people was amazing - locals and tourists alike, young and old, people alone and big groups, all gathered to soak up the atmosphere of another era and enjoy the live piano music (on a Bosendorfer no less) which varied from Bach to American musicals. The free wi-fi was the icing on the cake and you can bet I made good use of that! After that, I walked around enjoying just being there, recognizing famous buildings like the one above by Adolf Loos, that annoyed the Austrian emperor Franz Josef I when it was built, because it was so modern compared with the other buildings of the city - people called it "hose without eyebrows". Then my stomach reminded me that lunch was a long time ago and I should do something about it. 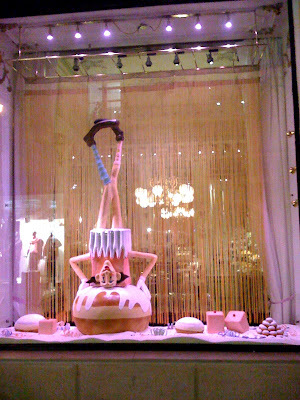 So I headed towards Café Berg, in Bergasse 8. I could not have made a better choice. The place had a warm, cozy atmosphere, mixing minimal Jugendstil details (an amazing pendant lamp) with modern, clean, simple, elegant lines and materials - minimal Viennese. A mixed crowd here too, although stylish young men (it is a very gay friendly bar-restaurant) did stand out. 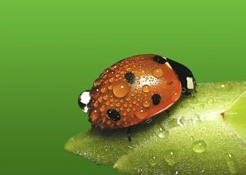 Service was fast, friendly and efficient (thanks Mattias!). The music was lounge and ethnic. And the menu? Really interesting to say the least. I had truffle ravioli in brown butter with fresh parmesan cheese and side salad (which turned out to be lamb´s lettuce salad with pumpkin seed oil and pine seeds): I savoured every bite! To wash it down, I picked an excellent Austrian Chardonnay, of which I had two glasses! It was an easy walk back to the hotel in the freezing night. You feel safe walking the streets at night in central Vienna, and the smartly illuminated buildings (not bathed in light but simply punctuated with it), travel you back to the Imperial era. Like the Votivkirche below, built near the Rathaus by Franz Josef I in 1879 to thank God he escaped an assasination attempt back in 1853. Thus my second day at Vienna came to an end. Euxaristoume gia tis yperoxes fotografies! there are such beautiful places on this earth, thanks for sharing!